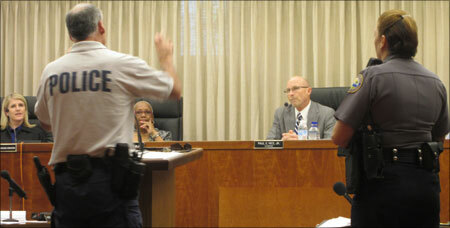 Paul Rice, pictured here listening to testimony from Daytona Beach Police Chief Mike Chitwood, conducted the City of Daytona Beach’s Nuisance Abatement Board meeting on August 8, 2014 wherein the City brought allegations against the Circus Bar for repeated drug and other unlawful activities. The Circus Bar had been previously declared a nuisance by the Board. After a full evidentiary hearing, the Board determined that the Bar had violated several conditions of the Board’s previous Order. In addition to numerous technical violations, the City also established that a shooting recently occurred on the Bar property wherein one man was killed and two others were wounded. The Nuisance Abatement Board is a citizen board whose members are appointed by the Daytona Beach City Commission. Mr. Rice has been chairman since 2000, having been recently re-appointed by Mayor Derrick Henry.